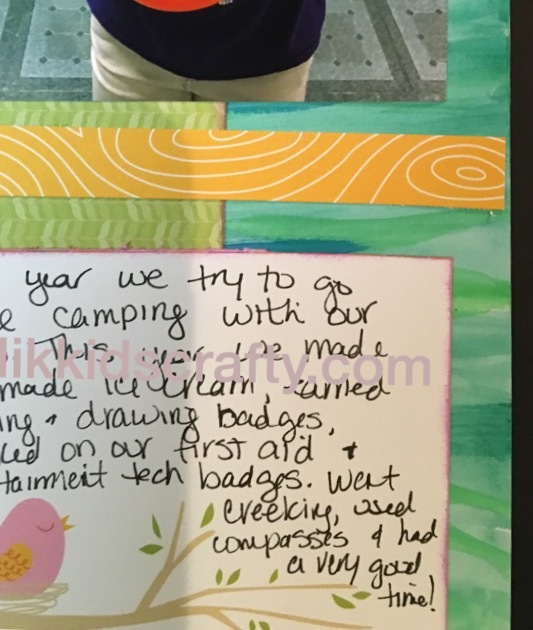 So, in March of 2015 I wrote This post about why I scrapbook. Everyone has a why. Do you know what yours is? Most people’s answer is that they want to preserve their family’s memories. And that is an awesome reason. Some crafter’s like the creative aspect. Some crafters use paper, some are purely digital, and others like me, do a combination (although since CTMH discontinued Studio J I have not done any more digital scrapbooking. I’m still heartbroken over that, but I do understand the reasons behind the decision). I do not feel there is one right or wrong way to scrapbook. Everyone has a different style and your scrapbooking should be a reflection of that. Crafters also evolve. When I look back in my earlier scrapbooks and see how much I have grown in this craft, I still get amazed! But today’s topic is about a topic crafters are not as open minded about (IMO). Its journaling. Scrapbooks do your future family no good if you do not journal and document. The very least it should include who, what, where and when. Some crafters however, don’t do that or just do the bare minimum. If it’s one thing I learned from realizing my “Why” it’s that I want people in the future looking at these albums to understand what was going on and how we are feeling. Sometimes I will hide the journaling behind a tab so a casual observer may not see it but it’s there to read. If your books have the great honor of being passed down generations after you are gone- these scrapbooks need to tell the story of your life. Those thoughts are what I think about when I journal. The other part of journaling that crafters become passionate about is not doing journaling in their own handwriting. Let me be the first to admit- I have AWFUL handwriting! And I have a few layouts where I made a mistake when journaling and had to cross it out. It’s not ideal but hey, thats me. I make mistakes quite a bit- that should be part of my scrapbooking as well! (at least that makes me feel better about it). I know some crafters that only type their journaling. Again, it’s a personal preference but that makes me so sad. I have just a few cards from my grandmothers with their handwriting. I can’t tell you what I would give to have more. Your handwriting has a style (like, mine is messy!) but I hope if you are one of those crafters that only type your journaling that you give it another thought. Think about anyone you may have lost that made a difference in your life. Aren’t there things about them you always want to remember? and some things that seem to slip away the longer they are gone? Or if you are a history buff like me- think of historical documents that have been preserved with the author’s actual handwriting and how amazing it is that you can see something actually written by that person 100 years ago, or more! I watched a BBC show where the host got to see the actual love letters Henry VIII wrote to Anne Boleyn that are currently housed in the Vatican. AMAZING! Some day, someone will want everything of you they can have so that they always remember you… including your handwriting! Give them that- even if it’s only a layout here or there to start off with. So the next time you do a layout, give journaling a second thought. 🙂 And continue preserving your family memories! Here is a sample of my awful handwriting (my watermark is over it, what is what the purple is) but you can see how awful my handwriting is! This isn’t a good example of everything that should be in the journaling, but I don’t typically zoom in on my journaling. I guess I should do so now and then! What is your scrapbooking and journaling style? Feel free to leave a comment below!